David Bradley Walk Behind Tractor Weeder Hoes for a Cultivator. 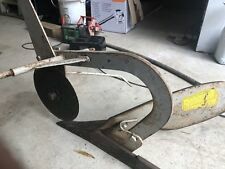 Clamps are included for cultivator. Very nice condition with sharp points light surface rust. Please look at pictures for detail. It's Rusty and has dents and scratches. On small crack on the front bottom. Doesn’t appear to ever been used. Still has original sticker on back of plow. Usually long gone after use. Has cosmolene grease on plow surface and colter wheel. Paint isn’t in the best of shape. The tire has the old original closed lug tread and fits the old David Bradley garden tractors and plows & manure spreaders manufactured by. Two New Hard-To-Find. not an old tire. It is from a new production built exclusively for Miller Tire. As Sold by the Sears, Roebuck and Co. - U. S.A. David Bradley. 5 H.P. Special Garden Tractor. Reprint of the 3/1955, Model Number 917.57583, Part Number S228A-2900B Manual. Real Paper Manual, Center Staple Binding, Made like the original. Nice rim in great shape. Know what the part is and if it will work for you. We are unsure about a lot of it. Sold as is. Pair of David Bradley 2 Wheel Walk Behind Tractor Hubs. You are buying a good used David Bradley 15 inch rim. Rim is in good used condition valve stem holes are good not rusted out anywhere. Buyer pays shipping. Thank you for looking email with any questions and as always I will gladly combine items when possible to help save on shipping. Front Grill or Grille removed from David Bradley Two Wheeled Tractor. Paint Looks to be original. Has a small dent on top shown with my hand in one of the photos. 2 WEIGHTS. 42LBS EACH. 14&5/8" DIA. Tractor Lug Tire. 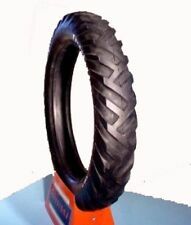 This tire is 6 ply tube type, 28.9" tall & 6.7" wide. This Buy-it-Now is for ONE tire. YOU ARE LOOKING AT A SET BOTH SIDES DECALS FOR THE LETTERS ON THE HOOD OF DAVID BRADLEY TRACTOR ( GREEN ) WALK BEHIND TRACTORS., DECALS ARE MADE FROM HIGH QUALITY VINYL. CAN BE INSTALLED IN A FEW MINUTES. You are buying a good air compressor/sprayer pump for the David Bradley tractors. Pump is in good used condition pumps air when you spin it has a good Oiler and pulley. Had this item for several years and never used it. Buyer pays shipping. Thank you for looking email with any questions and as always I will gladly combine items to help save on shipping when possible. 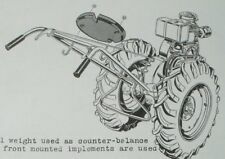 Garden Tractor Novelties. Garden T ractor Clock. and of course we are on the Web. Used Clutch plate from a David Bradley/Sears Walk Behind Tractor model 103. Used Lot of David Bradley/Sears Wheel Hubs, one spring went missing during the cleaning process, lt’s Not available or included in the sale. The depth wheels will need oiling to free them up. S110D - 11,050 - 12/52 (20 pages);. S92--22MB--2/50 (8 pages);. S60E--6MB-10/49 (12 pages);. To give you the best manual that will serve it's purpose of clarity, utility and longevity. AA7X-240-- 07-15-52 (20 pages). (11/60 (30 pages);. Five books rolled into one (52 pages total). THIS IS FOR FIVE BOOKS! To give you the best manual that will serve it's purpose of clarity, utility and longevity. ).